NEW JEANS! These Denim Flared Blue Jeans are a must have! The flared, bell bottom style jeans are super trendy right now and these are perfect! Model is 5’5, size 2/4 pants and is wearing a size small. Super comfortable absolutely love them! 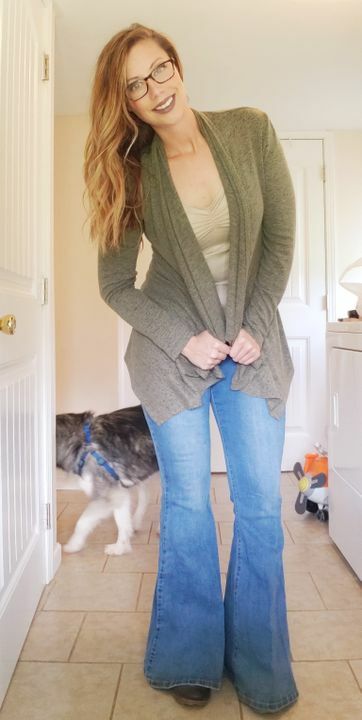 I purchased these flared bottom Jeans and turned heads with many compliments, they're super cute and fit very well, I love the way the hug your thighs. They run very long ( I'm 5'8 ) and wore heels to get them off the ground. Thanks Saved by the Dress, you have a new Fan! This jeans are great. Super cute and comfy. Fit perfectly.